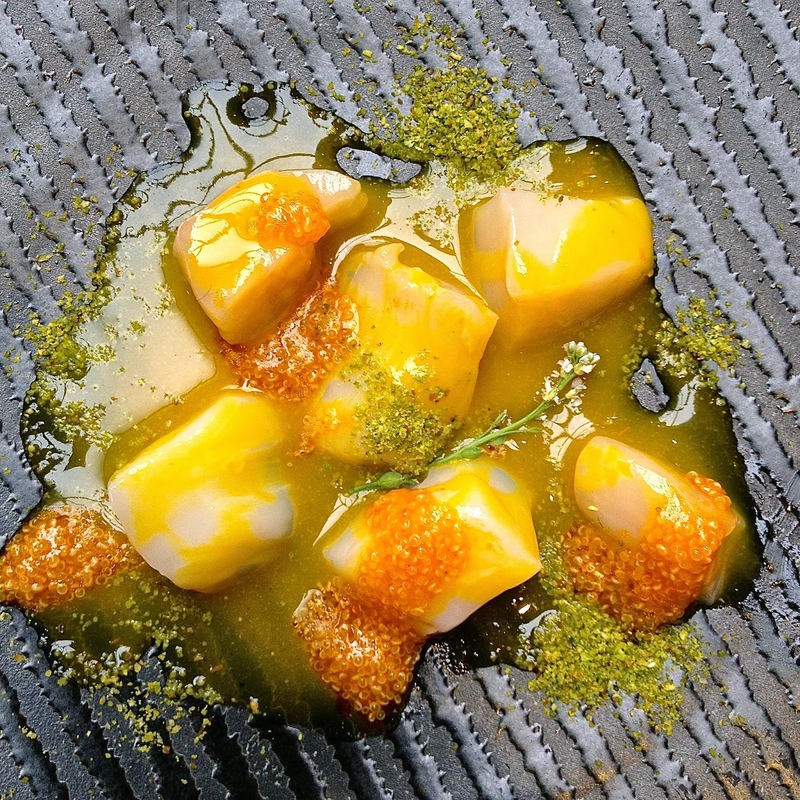 The London Foodie: Peruvian-Nikkei Cuisine Comes to London! Cost: Set lunches and the pre-theatre menus in Lima (London), available on weekdays, cost £20 for 2 courses, or £23 for 3 courses, plus £4 for a glass of red or white wine. From the à la carte menu, starters cost from £9 to £14, mains from £20 to £29, and desserts are all priced at £8.50. About: Lima opened in 2012, the third restaurant of Peruvian chef Virgilio Martinez, whose Central Restaurant in Miraflores, Lima I visited recently (to be reviewed soon). After a degree in law, Martinez studied at Le Cordon Bleu in London, and trained at restaurants in New York and Catalonia, and was executive chef at Astrid y Gastón in Lima before opening Central in 2010. Central quickly hit the San Pelligrino's 50 Best Restaurants in the World list, and in the latest 2014 list is ranked number 15. That's quite a pedigree, and so perhaps it is not surprising that within months of opening, the menu devised by Martinez and delivered by Robert Ortiz at Lima was awarded a Michelin star. The menu at Central focussed on authenticity, local ingredients and seasonality, and this is also the philosophy at Lima, where a number of dishes developed at Central are also featured. Most of the produce at Lima is from the UK, but it is supplemented by a range of native products from Peru's hugely diverse landscape. This special event was to introduce Peruvian-Nikkei cooking to London. Nikkei is the cooking of the Japanese diaspora, adapting the produce these migrants found in their adopted countries to traditional Japanese culinary techniques, creating their interpretation of Japanese dishes with a local twist. This cuisine is very dear to me because as a Japanese-Brazilian, it is what I ate growing up in São Paulo, cook at my home in England and occasionally serve as part of my Japanese Supper Club menu in Islington. Nikkei cooking can be found wherever there is a Japanese migrant community; these communities are significant in Brazil, where the largest Japanese community can be found outside of Japan, and also Peru, home to the 2nd largest community. It is in Lima that arguably this style of cooking has reached its highest expression, pioneered by Nobu Matsuhisa and his colleague Toshiro Konishi, followed by the next generation of outstanding Nikkei chefs like Mitsuharu Tsumura (known as Micha). Micha's Maido Restaurant (Latin America's 11th Best Restaurant 2013) in Lima is another wonderful spot I visited on my recent trip to Peru which will be reviewed shortly. Micha has written an entire book on Nikkei cooking published last year "Nikkei es Peru" and is undoubtedly an authority on the subject. I met and interviewed Toshiro Konishi and Micha while I was in Lima, and so was very excited to see Peruvian Nikkei cooking featured in London, and to have the opportunity to see him and Virgilio once more on home ground, as well as Virgilio’s partner and head chef Pia. What We Ate: The menu was structured with Pia, Vergilio and Micha’s dishes to show a wide range of Peruvian native ingredients, as well as Nikkei techniques and flavours by Micha. To kick off proceedings, a platter of appetisers was served, which included Micha’s octopus with botija olive tofu and black quinoa, porcon mushroom with squid and wakame, and a steamed bun with fish chicharron (deep-fried battered fish) and zarza (or salsa) criolla made from onion, lime and coriander. Pía cooked langoustine and huarango tree, a native tree from the desert in South Peru and whose sap tastes sweet like maple syrup, while Virgilio presented a dish called 'corn diversity', one of his creations at Central with four types of Peruvian corn including choclo (soft white fresh corn) and chulpi (dried and crunchy), presenting myriad flavour and texture contrasts. We were then presented two takes on Peru’s national dish, ceviche. Micha’s version was one of the most beautiful interpretations I have encountered, served in a striking purple sea urchin shell, combining rock fish and clams, sea urchin, tobiko eggs and yuyo (an Andean cooking herb), and topped with tempura(ed) samphire. Virgilio's ceviche was also outstanding, with scallops, chia seeds and tumbo (a Peruvian passion fruit). This was refreshing and zingy, with delicious acidity. Micha’s selection of nigiri-zushi came next - scallops with an emulsion of maca, cushuro and chalaca - featuring some uniquely Peruvian ingredients, like cushuro (aka Andean caviar), a freshwater alga that grows only above 3000 metres. Rich in protein, it looks rather like the spherified chlorophyll beloved of molecular gastronomy, but is a naturally occurring foodstuff. Maca is another native of the high Andes, grown for its nutritious and allegedly healthgiving root - some even joke that maca is the Peruvian natural Viagra! Silverside fish, with nori and leche de tigre emulsion was another Nikkei nigiri-zushi. Leche de tigre (tiger's milk) is a typically Peruvian sauce used in ceviches and tiraditos, which in its purest form is simply the juices of the lime and fish marinade. The last nirigiri sushi featured very tender skirt beef with ponzu dressing (Japanese citrus dressing) topped with a fried quail egg. This was deliciously flavoursome, and visually quite stunning. The main courses, titled 'Diversity' included a wagyu short rib nitsuke with potato cream and purple corn from Micha. Nitsuke refers to the Japanese technique of simmering fish or meat traditionally in a mixture of soy sauce, mirin, sugar and sake. 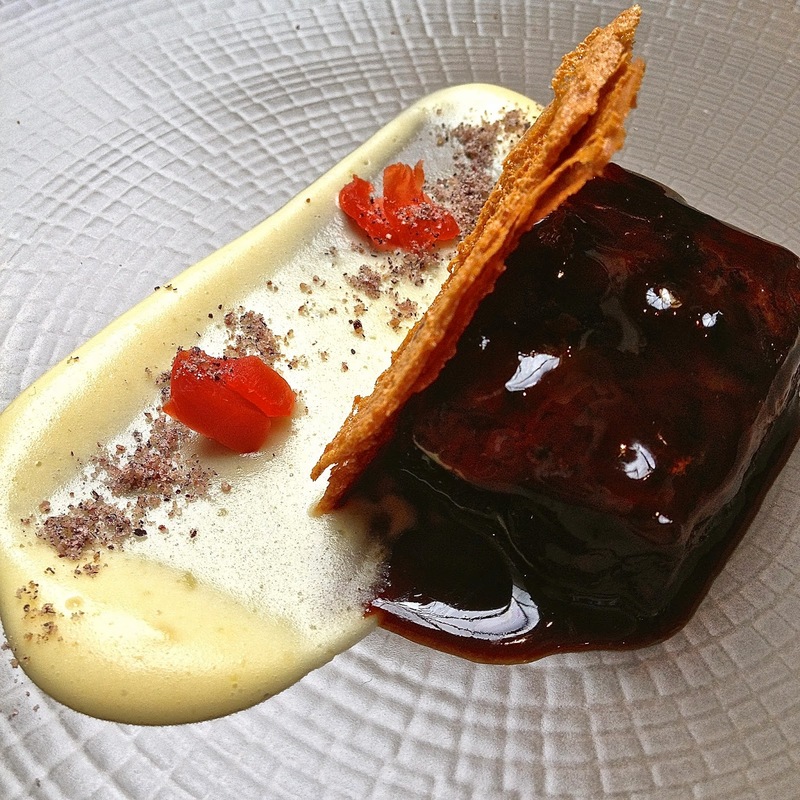 The short rib was yieldingly tender and delicious, and served with an intense and glossy reduction. Purple corn is ubiquitous in Peru, and is used to make the hugely popular chicha morada (a purple corn soft drink). 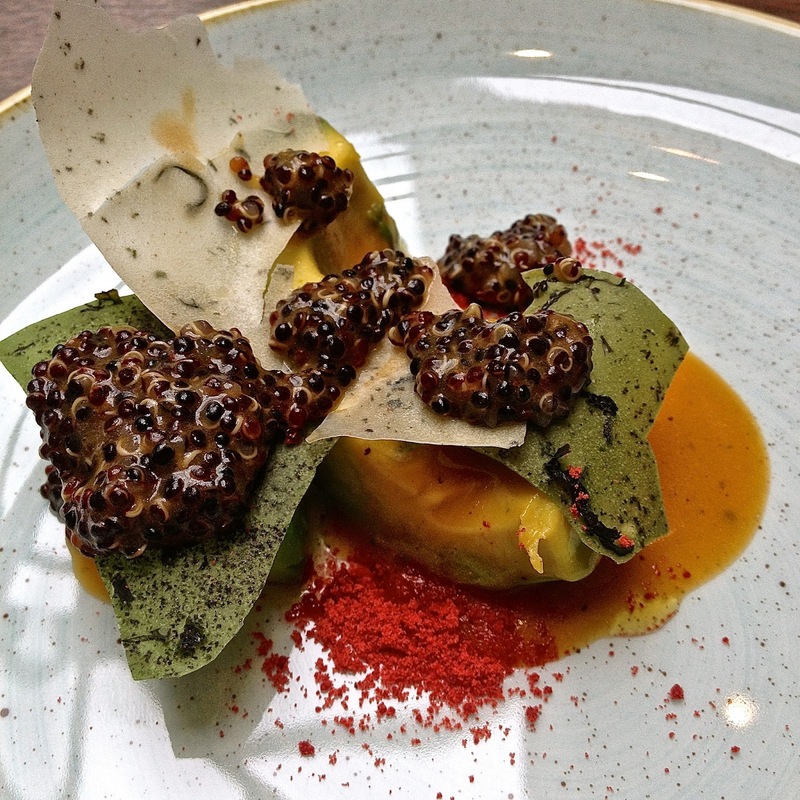 Virgilio’s main course was a dish of avocado, Andean pseudocereals and tomato tree. Grown between 2000 and 4000 metres, Andean pseudocereals including quinoa and amaranth, are noted for their high anti-oxidant content, and worked a treat in this dish, imparting a nuttiness and crispy texture to the creamy avocado, making a fabulous dish. To wrap up our Nikkei lunch, we were served two desserts - Micha’s ice cream of bahuaja nut (native to south-eastern Peru, and similar to Brazil nut), with crispy bahuaja nut and mango while Virgilio served 'Hoja de Coca' Jungle, or coca leaf jungle – both were creative, using intriguing and unusual Peruvian ingredients that were a delight to discover in this part of the world. What We Drank: Lima serves probably the best Pisco sours this side of the Atlantic, and we enjoyed a couple of those as aperitifs. 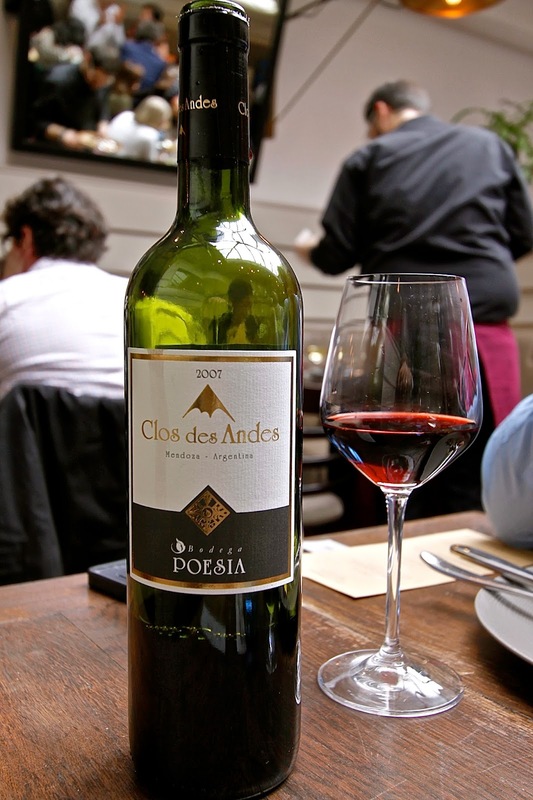 We also drank some fine Clos des Andes 2007 by Bodega Poesia, from Mendoza in Argentina. Likes: Sophisticated Peruvian-Nikkei cooking, with some truly unusual and delicious native ingredients from the Amazon and the high Andes. 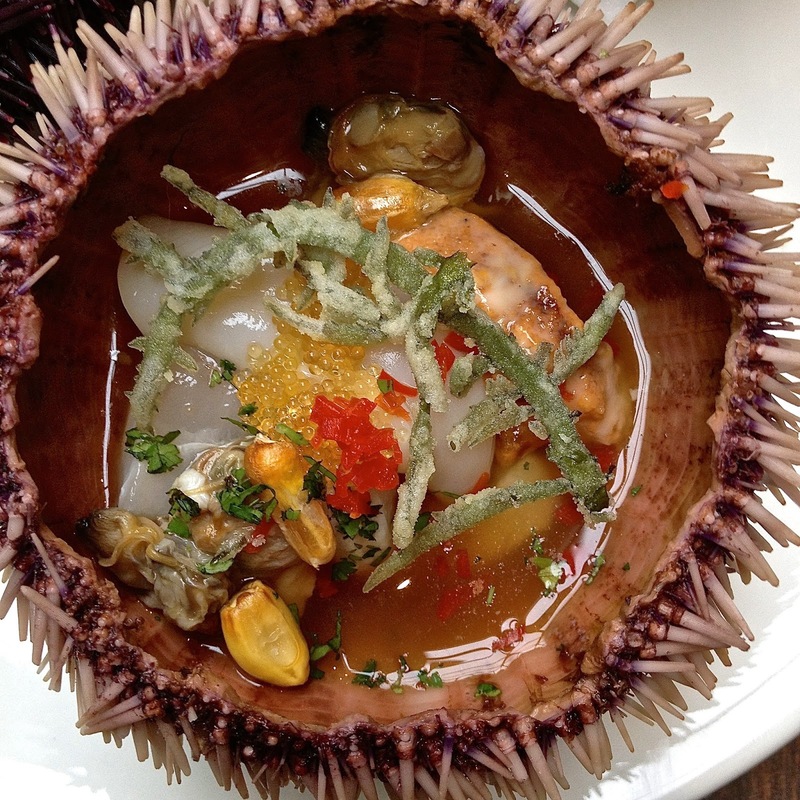 The sea-urchin ceviche was truly outstanding and for me the highlight of the meal. Verdict: Lima is a wonderful restaurant, fronted by Virgilio Martinez, one of the most talented young chefs in the world. I cannot think of a better place to introduce Peruvian-Nikkei cooking to the UK and to discover on our very doorstep why there is such excitement about Peruvian cooking throughout the world right now. Highly recommended.